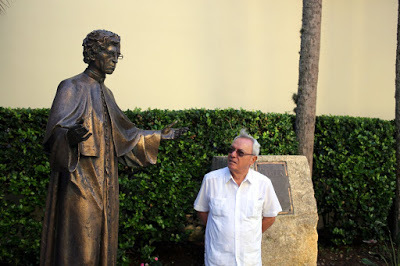 Dr. Eusebeo Leal, historian responsible for the restoration of Habana Vieja, visits the statue of Father Felix Varela in St. Augustine. When Varela was forced into exile by Spanish authorities because he opposed slavery and colonialism, he embraced the famine Irish in New York. As a former Spanish colony liberally painted with French, African, American, Jamaican, Irish and indigenous Taíno influences, the breadth of Cuba’s heritage is staggering. Important historical heirlooms – forts, palaces, hotels and colonial towns – dominate the Cuban landscape, and many of them are being faithfully restored. Rhythms and melodies are ubiquitous in this melting pot of African, European and Caribbean cultures. It’s like no other place on earth. Join us for an educational seven-day experience in this open-air classroom. Our Cuba Cruise, embarking from Montego Bay, Jamaica, gives you the chance to begin to explore Cuba. What makes Cuba so unique is its warm, vibrant people, simultaneously welcoming, engaging and sincere, as complex and distinctive as the dense percussion and exultant vocals in their music. Cuba is home to survivors and improvisers, poets and dreamers, musicians and dancers…the people of Cuba have kept the country and its effervescent, seductive culture alive for centuries. Our Cuba Cruise is an opportunity to meet and mingle with these people, to see their day-to-day lives in three dimensions, to ask questions. Cuba remains a unique and paradisiacal destination, a captivating anachronism, in a world that seems to become ever-more globalized. We invite you to share it with the people of Cuba and to learn everything you can about this unique island nation. Americans can also begin the cruise in Havana on Monday (or Tuesday). Overnight stays are possible before embarkation or after disembarkation to assure flight connections. A longer supplemental program in the Havana area can also be arranged under the general license of the Fund for Reconciliation and Development by contacting director@ffrd.org . Available accommodations are most likely in a private bed and breakfast. Jorge G. Arocha is a Professor of Philosophy at the University of Havana, the oldest university in Cuba and one of the first in the Americas. The University of Havana was founded in 1728 and counts past and present national leaders among its illustrious Cuban alumni. Professor Arocha will sail with us for the entire cruise and will be available to answer any questions you may have about Cuban culture and history, both fascinating and incredibly rich. During this briefing, professor Arocha will welcome all people-to-people program participants on board. He will then take you through the week’s culturally enriching program. Cuba is a country with a very diverse culture and the visual arts are no exception. In recent years, a number of distinctive trends have emerged in Cuban visual arts with references to themes and characters based on the Afro-Cuban culture. Professor Jorge G. Arocha invites you to an insightful presentation on board, during which you will have the opportunity to participate in discussions on manifestations of the rich cultural heritage of the country. Evening (45 minutes) – Dance like a Cuban: It’s Salsa Time! Cuba is the birthplace of many dances such as Cha-Cha, Son, Danzon, Danzonete, Mambo, Rumba, Salsa, Bolero and many others, all are a celebration of Cuban life and music. Salsa dancing originated in New York in the mid-1970s. It evolved from earlier Cuban dance forms, such as Cha-Cha-Cha and Mambo and incorporated elements of both swing dancing and disco, which jostled for space on the dance floor with Afro-Cuban and Afro-Caribbean dances such as Guaguanco and Pachanga. Salsa dancers shift their weight with each step, keeping their upper bodies parallel to their feet as if unaffected by the movement of their hips. The Cuban Casino style of salsa dancing involves “up-and-down” shoulder movements and rhythmic twists of the torso. Its rhythms are insistent and infectious; they make it impossible to sit still, so don’t even try! Let our professional Cuban dance instructors take you through all the salsa steps you need to know during the first fifteen minutes of the class. Once you’ve learned the steps, you’ll have the next half-hour to put what you’ve learned into practice with the assistance of our instructors. Beautiful Santiago de Cuba is the second-largest city in Cuba and the capital of the province of Santiago de Cuba. Santiago is actually closer to the island of Hispaniola (home to the Dominican Republic and Haiti) than it is to Havana, thus a strong current of Afro-Caribbean culture sizzles through its “avenidas” and alleyways. The Revolution started here, as did Bacardi rum, salsa and son. Santiago’s rhythm is uniquely its own. We will meet with Dr. Martha Cordié Jackson, a historian and the director of the African Cultural Center “Fernando Ortiz.” Following Dr. Jackson’s presentation we will enjoy a dance performance, and have a chance to speak with the performers afterwards. Next, we will visit three iconic locations. One is a memorial to Antonio Maceo, the "Bronze Titan,” who led two wars for independence before he was slain by Spanish bullets in 1896. The second is San Juan Hill, where Teddy Roosevelt and his rough riders defeated the Spanish in 1898 after the USA entered the Cuban-Spanish-American War. Our third visit will be the Moncada Barracks, where Fidel and Raul Castro commenced their 1953 assault on the Batista regime. After our tour, you may return to the ship for lunch and relaxation, or you can opt to be dropped-off in the colonial central square of Santiago, home to the city’s cathedral, shops and privately-owned restaurants (called “paladares”). After walking along the streets of this colonial gem, you can return to the ship on foot or by taxi. Professor Jorge G. Arocha takes you from the discovery of the Caribbean by Christopher Columbus through the Cuban-Spanish-American War in a fascinating presentation about the birth of the Cuban nation. Share time with our Cuban staff during your week together. Learn about what it’s like to grow up in Cuba, get firsthand insight into their daily lives and develop a real understanding of their culture, their history and their customs. This is a once-in-a-lifetime opportunity to get to know the people of Cuba and hear their stories. Most are comfortable speaking in English but are happy to help you practice your Spanish. Evening (60 minutes) – Dance like a Cuban: It’s Rumba Time! Rumba is a group of rhythms, music and ballroom dance that originated in Cuba. The name “rumba” is derived from the Cuban-Spanish word “rumbo,” which means "party" or "spree" – Habaneros of African descent used the word as a synonym for party. 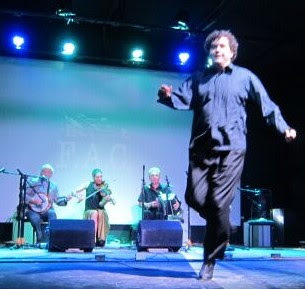 Rumba is based on African music and dance traditions, namely Abakuá and yuka, and is also derived from the coros de clave, which originated in Spain. Cuban rumba comprises the three traditional forms of rumba: yambú, guaguancó and columbia. Our Cuban dance instructors will take you through the steps during the first 15 minutes of class, and then they’ll turn you loose on the dance floor. Get ready to rumba! Join us for a Cuban cooking lesson, one that gives you a chance to discover some of the many “gems” of Cuban Cuisine. You will learn how to take fresh ingredients and create incomparable tastes that burst with the flavors of Cuba. Our chef will show how Creole and Spanish cuisine blend to create the authentic, singular Cuban gastronomic experience. Simple, hearty and incredibly flavorful, you’ll learn what you need to try your hand at cooking these dishes at home. Cuba is known worldwide for its hand-rolled cigars. If you love cigars, this presentation gives you the opportunity to learn how the country’s beloved “Habanos” are produced! Christopher Columbus is generally credited with the introduction of tobacco to Europe. Three of Columbus's crewmen on his 1492 journey to the New World are said to have encountered tobacco for the first time on the island of Hispaniola, then again on Cuba. This presentation will give you a comprehensive understanding of the origins of tobacco and how the Cuban cigar industry was born and developed. Please join us for a full-length, informative documentary about Cuba. This presentation is a general characterization of the Cuban culture, taking the ajiaco as the main response to the question: What is the Cuban people? “Ajiaco” is the name of an Indian soup of the Taíno population. It’s made with sweet potato, yucca root, plantains, corn and meat (beef and/or pork), and several other ingredients. It requires a lot of stock, as well as lemon juice and aji (like the chili, but softer). This is one of the staples of Cuban cuisine. As well, the dish is symbolic of Cuban culture – a diverse mix of different races, accents, religions, and myths of Cuba, all stewed together like the ingredients in the ajiaco. Professor Arocha will also discuss the geography of Cuba, its national symbols (including the national bird of Cuba, the tocororo), historical places in Havana and the Spanish spoken in Cuba. Cuba is known as the Isle of Rum, thanks to her world-famous sugar cane, her delightful Caribbean climate, her fertile soil, and the unique knowledge of Cuban "Maestro Roneros" (master rum-makers). Cuban rum began as “tafia,” fermented nectar made with the island’s sugar cane and enjoyed by sailors and swashbucklers alike. With the introduction of copper stills in the 19th century, Maestro Roneros took their first shot at aging Cuban rum, and its quality improved immensely. Pedro Diago, the father of Cuban rum, had the idea of storing the "aguardientes", or eaux-de-vie, in pots and burying them to age. In the second half of the 19th century, the result of these developments was the introduction of lighter, more refined rum, "Ron Superior," which was requested by the Spanish crown to serve to the Spanish court and to the “elite of the Empire.” It was so popular that by 1860 Cuba was home to more than 1000 distilleries. Join us for a deeper look into the fascinating history of Cuba’s national drink, and for a taste of some of her finest rums. Get together again with different members of our Cuban staff. Ask them about their experiences growing up and living in Cuba, and answer questions they might have about life in the USA. You should also feel free to ask them whatever questions you have after experiencing the real Cuba in vibrant Santiago de Cuba. Expect to make new friends and hear how they live, play, and work in Cuba. Join Professor Arocha for an in-depth discussion on what makes Cuba different from her Latin American neighbors. Whether it’s the Spanish spoken in Cuba, her literature, her music, her cuisine…Cuba is a singular place, and Professor Arocha will take you on a brief tour of what makes her unique, followed by a question and answer session. Evening (60 minutes): Dance Like a Real Cuban: It’s Cha Cha time! Everybody Loves to Cha Cha Cha! The cha-cha-cha is a Cuban dance created in 1953 by Cuban composer and violinist Enrique Jorrin. The cha-cha-cha is a fast ballroom dance similar to the mambo – it follows a rhythmic pattern based upon a quick three-step movement, cha-cha-cha. Let us give a bit of the history of Cuban Terpsichore and teach you how to dance an authentic cha-cha-cha! From all over the city of Havana one perceives a rumor of trees and conversations, of plenitude and freshness. As the Caribbean’s largest and most vivacious city, Havana’s romantic atmosphere and boundless energy are legendary. “Anything is possible in Havana,” wrote British novelist Graham Greene of Cuba's magical capital. One of the world's great urban centers, this tough but elegant tropical metropolis is a cosmopolitan cocktail of stirring monuments and festive music. It has few cultural equals. Habaneros love their city, and it’s easy to see why. Amid the sweet blue waters of the sparkling Caribbean, over five centuries of history have helped shape one of the Hispanic world’s most electric and culturally unique societies. A stomping ground for pirates, a fortified slave port for the Spanish and a gambling capital for the American Mafia, Havana has survived it all. The city has given the world mambo and salsa, mural paintings, Cohiba cigars, Havana Club rum…Havana is the heart of Cuba, and it beats with unstoppable, celebratory passion. We begin our immersion in miraculous Havana with a presentation on board the ship by a historian or architect from the city. There will be time for questions and discussion with our speaker. Old Havana and its fortifications are a UNESCO World Heritage site. Join us on this tour to experience the majesty of colonial Havana. The city was founded in 1519 by the Spanish, and by the 17th century it had become one of the Caribbean's main centers for ship-building and provisioning. The old city center comprises a breathtaking mix of Baroque and neoclassical monuments and a homogeneous ensemble of private houses with arcades, balconies, wrought-iron gates and internal courtyards. Come meander along the narrow streets of this fascinating city with our expert guide, who will regale you with tales of this magical city’s storied history. We begin with a walking tour of the historical center of Habana Vieja, where we’ll see the Arms Square, the Royal Forces Castle, Saint Fransis of Assisi Square, the Cathedral Square and the Old Square. We’ll visit a graphics workshop, and see local artists at work – you’ll also have a chance to interact with them. Afterwards you can either return to the ship for lunch or discover one of the many private restaurants (“paladar”) in Old Havana. We begin our afternoon with a guided bus tour through the 19th and 20th century transformation of Havana into its modern iteration. We will pass by “Paseo del Prado” (the Promenade), the Grande Teatro de Havana and the Capital Building. We will visit the Plaza de la Revolución, where May Day marches political speeches, and Papal masses have taken place. There’ll be time to take photos at the Jose Martí Memorial and at the National Library. This segment of the excursion traces how Havana grew from the underprivileged sections within its walls, such as Centro Habana and Chinatown, to include the middle class and wealthy neighbourhoods, such as Vedado, Nuevo Vedado, Miramar and the International Business Centre, beyond its walls. We’ll see the famed escalinata (stairway) and the Alma Mater statue at the University of Havana, La Rampa entertainment zone, the Coppelia ice cream parlor and the Habana Libre Hotel (formerly Havana Hilton) and the famed Nacional Hotel. You’ll also have a chance to purchase authentic Cuban souvenirs and gifts from self-employed artists, craftsmen and vendors at San José Market. It’s morning in Havana. N’Sila Che Che is a performance ofAfro-Cuban music and dance on board the Celestyal Crystal bya group of local artists who are believers in the three dominant strains of Afro-Cuban religion in Havana: Santeria, Palo Monte and Abakuá. The performance will be introduced by Dr. Raisa Fornaguera de la Pena, director of the municipal museum of Regla. After the performance, feel free to disembark and continue exploring Havana and meeting its people on your own. Find the most appealing local cuisine or return to the ship for lunch. modern works at the Museum of Fine Arts just across the street. Finish your Havana adventure with an independent stroll along the cobblestone streets of the old city. Cuba is home to 7000 species of plants (half of them endemic), and the country’s fauna is incredible featuring 35 mammal species (24 endemic), 350 bird species (23 endemic), 121 reptiles (103 endemic) and 48 types of amphibian (42 endemic), including the bee hummingbird, the butterfly bat and the Cuban crocodile. Many of these unique plants and animals make their homes in the country’s approximate 3,400 square kilometers of national conservation areas. Join Professor Arocha for a lively presentation about Cuba’s unique ecosystem and its residents. Evening (60 minutes): Dance like a Cuban: Now You Can! Come join us for a potpourri of Cuban dances and live Cuban music! Are you ready to cha-cha-cha, mambo and salsa? Give it a whirl under the guidance of our expert Cuban dance instructors. 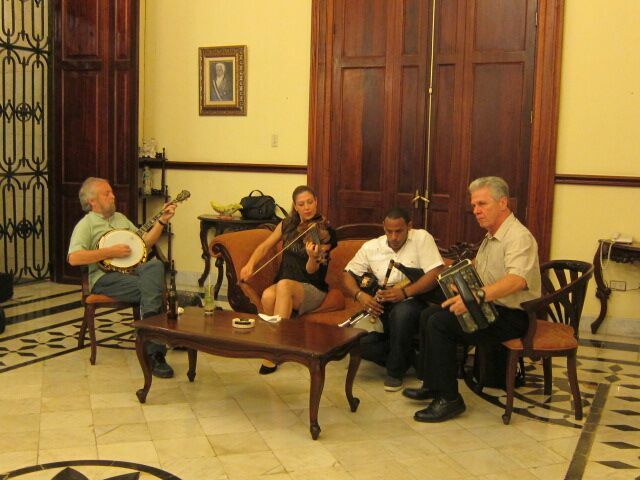 Our authentic Cuban band will make it impossible for you to stay away from the dance floor. Maria la Gorda, in western Cuba, is a palm-fringed oasis of sugar-sand and clear water amidst banana fields and tobacco plantations. The diving camp here, also named Maria la Gorda, is the perfect place to embark on an exploration of Cuba’s coastal treasures. Visit some of the Caribbean’s most astonishing coral canyons and caves – there are more than 20 dive spots here and an incredible array of tropical marine life. Today you’ll have a day to discover Maria La Gorda and her natural wonders at your own pace. Join us for a fascinating lecture by Professor Arocha about the history of modern Cuba. He will take us from the dictatorship of Fulgencio Batista, the last days of which were immortalized in The Godfather Part II to Biran, the birthplace of Fidel and Raul Castro and to Santiago de Cuba, specifically the Moncada Garrison where the first shots of the Cuban revolution were fired. Hungry for authentic Cuban food? Join Professor Arocha and a team of Cuban chefs for a demonstration on how to prepare festive Cuban dishes, with a focus on fresh ingredients and ease of preparation. Professor Arocha will share the history of these dishes as they are prepared. Come hungry! Evening (60 minutes) – Dance like a Cuban: It’s Mambo time! The mambo is a fast ballroom dance of Cuban origin – it’s rhythmically similar to the rumba and cha-cha-cha, but its pattern of steps is more complex. After its birth in Cuba, both American and Mexican dancers and musicians made significant changes to the mambo, helping it develop into its modern form. The word "mambo" means "conversation with the gods" in Kikongo, the language spoken by Central African slaves who were brought to the Caribbean. Modern mambo began with a song, "Mambo," recorded in 1938 by brothers Orestes and Cachao López, two legends of Cuban music. Cienfuegos, “the Pearl of the South,” was founded in 1819. Situated on the Caribbean coast of southern-central Cuba at the heart of the country’s sugar cane, mango, tobacco and coffee production area, the town first developed in the neoclassical style – it became more eclectic as it grew but still retained a harmonious overall townscape. Our first stop is the University of Cienfuegos, where we’ll have a rare opportunity to interact with the university’s dynamic and engaging professors – they are looking forward to sharing insights about their city with you, both its storied history and its future. We’ll then visit the Plaza de Armas, the traditional central square of Cienfuegos, and the magnificent Teatro Thomas Terry. Built between 1887 and 1889 to honor Venezuelan industrialist Tomás Terry, this 950-seat opera house and theater is decorated with marble and hand-carved Cuban hardwoods. Don’t forget to look up for a view of the theater’s ceiling frescoes. We will also visit the Graphic Society of Cienfuegos, where we’ll view prints and meet with the artists who offer programs for children with special needs., You may either conclude your visit seeing the unique architecture of the Palacio de Valle and return to the ship for lunch or stay in the Plaza de Armas to savor a meal in a local paladar and explore Cienfuegos on your own. Professor Arocha will give a presentation about the musicality of the Cuban people. Bolero, cha-cha-cha, guajiras, mambo, rumba, sones, trova…how can one island produce so much music, so much dance, all of it beloved the world over? Professor Arocha will discuss the African and European influences in Cuban music and how this vibrant music has become so central to Cuban life. This is an opportunity to ask questions and reflect on your experience in Cuba with Professor Arocha, with our Cuban crew and with any of the American staff accompanying you. Try a real mojito, and then learn the history of this fabulous and refreshing cocktail. Some historians believe the African slaves who worked in the Cuban sugar cane fields during the 19th century were instrumental in the cocktail's origin – guarapo, the sugar cane juice often used in mojitos, was a popular drink amongst the slaves, who came up with the name of this sweet nectar. Our Cuban mixologists will teach you how to make the best Cuban cocktails while taking you through the rituals, stories and urban myths behind these drinks. Our final Cuban dance party! Come join us for a real fiesta! You’ll have a chance to use everything you’ve learned about cha-cha-cha, mambo, salsa…expect a late night. Cuba Cruise has worked closely with the Fund for Reconciliation and Development to create a general license people to people itinerary that meets current US legal requirements for a full time program of educational and cultural exchange activities for US citizens and residents traveling to Cuba. Special shore excursions have been designed to be in compliance with US regulations while providing opportunities for personal discovery and independent meals. On board an array of talks, demonstrations and lessons are offered so that passengers may choose those of greatest personal interest. The two opportunities to meet with Cuban crew should be on everyone's agenda. September 8, 2015 | 9:38 a.m. Regardless of where you stand on normalization of American-Cuban relations, there's no doubt that the people of Cuba can benefit from humanitarian assistance after the long U.S. embargo. As one who has been to Cuba many times, I now prefer a more meaningful, and decidedly helpful, way to experience the wonderful Cuban culture and hospitality. I travel as a volunteer and have discovered the heart of Cuba by doing so. Julio, Ramon and Maria are who I think of when I hear that Wi-Fi is finally being provided to ordinary citizens. It's the beaming faces of the children to whom we taught conversational English that I see. I know personally the effect of our governments' decisions in each of the homes I've visited. When Secretary of State John Kerry celebrated the formal opening of the American embassy in Havana, I recalled what our inspired Cuban host, Eduardo Gonzales, said in greeting our last volunteer team: "You'll help us bring about the necessary changes our nation craves. But most important, you help us build bridges over which our governments can walk." By getting to know Cubans as people, beyond the music, cigars and stereotypes, we can explore our commonalities and become enriched through our knowledge. As Gonzales stated, "By working together, we realize that we all hope, laugh, eat, worry and care about our children's futures. We can easily become friends." Of course, the diplomatic intricacies are complicated. But our people-to-people relationship certainly opens doors. For instance, I stopped at a fruit and vegetable stand to buy some bananas, and when I went to pay, the owner said, "This is my gift to you for coming here to help out the Cubans." I walked away with my fruit, a big smile and tears in my eyes. For two weeks, my team of 15 volunteers taught English to 44 children and adults, assisted 10 farmers on community gardens and helped a church maintenance crew repair a water catchment. None of us is a professional in these areas, but we gave of ourselves in our own ways. Each day and on the weekend, our Cuban friends shared cultural and educational activities with us. They gave more to me than I could ever give to them. Every day was an adventure for our souls and minds. I look forward to my ninth Cuba trip and urge all my friends to join Global Volunteers: www.globalvolunteers.org. PAMELA CROMER lives in Irvine. Sabre Corporation has announced the development of a capability that helps travel agents in the U.S., Puerto Rico and the U.S. Virgin Islands to comply with recently liberalized U.S. regulations for trips booked to, from or within Cuba. Here's how the process works. Sabre Corporation has announced the development of a capability that helps travel agents in the U.S., Puerto Rico and the U.S. Virgin Islands to comply with recently liberalized U.S. regulations for trips booked to, from or within Cuba. Available to travel buyers and tour operators, the Cuba Traveler Certification capability enhances the user experience in agents’ service desktops, Sabre said. The company is utilizing the standard Cuba travel certification form for passengers developed by the American Society of Travel Agents (ASTA). Built on Sabre’s industry agency workspace, and powered by API technology, the Cuba Traveler Certification capability automatically alerts agents when they have booked an itinerary with air travel to Cuba in order to access the required certification form, transmit the needed data to the transporting airlines, and email the certification form to customers for their records. Cubans are rushing to the beach because of the possible surge in prices after Americans start coming in. Cubans are flocking to the beach in record numbers before a possible end to the US travel ban that would open the gates to American tourists and bump up prices. Until 2008, the Communist government banned Cubans from tourist hotels. Since then, the industry has been shocked at how many Cubans check in: 1.2 million permanent Cuban residents last year, up 23% from 2013. The government's tourism officials have reported another increase this year, without providing figures. Experts say many of those visiting beaches and hotels are able to afford it because they receive money from relatives living abroad, especially in the United States. In a clear sign of the changing times, state television news recently ran a segment informing Cubans of the proper etiquette for vacationing in the same resorts as foreigners. "Keep voices low, don't smoke, and don't litter," the newscaster said. "Hopefully when visitors return home they can say they saw more than beautiful beaches and classic cars; hopefully they can say how well-mannered Cubans are." Varadero, about 100 miles (160 km) east of Havana, is Cuba's leading beach resort, boasting fine white sand and turquoise blue waters. Cubans are now the number two source of tourists at Varadero, trailing only Canadians, and they are slightly ahead of Canadians nationwide. "What's more, Cuban clients aren't just staying in the more standard hotels, but in the chain's best," said Narciso Sotolongo, deputy director of sales for Melia Hotels International in Cuba. The Spanish hotel chain is Cuba's most important foreign partner in tourism, managing 27 properties on the island. Nearly 80,000 Cubans have stayed at Melia properties this year, a 35 % jump from this time last year. Since Melia opened to locals in 2009, the surge has averaged 32 % a year. Cuba received a record 3 million foreign tourists in 2014, and visits were up 17 % year-on-year in the first seven months of 2015. More and more Americans are coming. Experts in the tourism industry predict 150,000 American visits by the end of this year, up from 91,000 in 2014, and many believe there could be massive growth in coming years. As part of detente with a former Cold War enemy, United States President Barack Obama has eased restrictions on travel to Cuba. While tourism in Cuba is still specifically banned, some Americans manage to visit and find their way to a beach. President Obama has already authorise direct flights to Cuba, cruise ships and ferry service as long as there is an educational purpose to travellers' stay in Cuba. Legislation to lift the travel ban appears to be blocked by the Republican majority in Congress, but the lobby in favour of engagement with Cuba believes Obama's administration will do more to weaken restrictions and perhaps force the Republicans' hand. The administration has shown virtually no interest in prosecuting Americans for vacationing in Cuba and the tourism industry is preparing for an eventual lifting of the travel ban. "One of Obama's policy goals is to inject money into Cuba's private economy and this can be done through tourism and remittances," said Richard Feinberg, a Cuba expert and former national security advisor to US President Bill Clinton. Hotels that formerly denied admittance to Cubans now offer special deals for locals, primarily to fill rooms in the summer months during international tourism's low season. Jose Luis Perello, an economist and professor of tourism at the University of Havana, estimated the rise of domestic tourism is almost entirely linked to Cubans residing abroad, who send money to their relatives back in Cuba, allowing them a higher standard of living and to set up their own businesses. In 2009, Obama eliminated restrictions on remittances and family visits for approximately 2 million Cuban-Americans. Other economists attribute the growth more to President Raul Castro's economic reforms since he took over in 2008, which have boosted purchasing power for some, primarily through allowing small private businesses. "You walk down the street in Varadero and realise it's totally full of Cubans, whereas before you would always see more foreigners. Things are changing for Cubans for the better," said Madeline Baro, standing on the beach with her young daughter. Baro is married to a driver for a foreign company, a relatively high-paying job. Most Cubans lack that luxury. "With the basic Cuban salary, you could never even dream of having a vacation with your family. Never," said Irenia Gomez Oviedo, a cashier. She said she and her family were able to spend two nights in Varadero thanks to money from her father, a private business owner. Even with the help, they had to save for a year to pay for the all-inclusive hotel at a rate of $50 per night, she said.